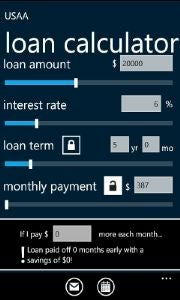 For example, the best WP7 apps are built on pages (or "panes") that can be moved backwards and forwards from side to side, as well as scrolled up or down to get to all the content on one "pane." 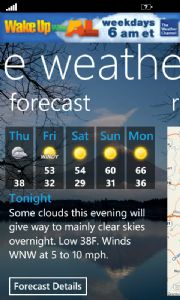 The best apps have a "hub" on the WP7 home screen that displays dynamic information from the app (e.g. "The Weather Channel" app). Microsoft has a booth set up on the fourth floor of the conference center here in Austin, near the press room, where it is showing off its best Windows Phone 7 apps. 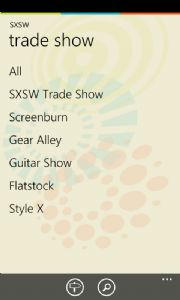 The company has been working hard since last November's WP7 to get developers to write apps for the platform. Microsoft has taken special pains to make sure that the most popular apps on the Android and iPhone platforms are available on WP7; this, of course, is crucial to consumers considering the leap of faith to WP7.